Hi I am kinda new to this forum I never posted but had an account. This is my second time owning gliders the last time was about 7 years ago and I had a rescue pair then. I recently got a rescue colony �kinda� they girl is moving and gave them all to me. I have 5 females and 2 males. But 3 females live together and 2 live alone. The reason is they would fight in the cage. But if I put enough toys and extra food bowls do you think they can live together?. The cages they lived in are small bird cages they used to live as colony in a double wide flight cage but never had toys I have known these gliders for a while and was very happy to take them from her to give them a real home. She used to breed them for money not because she loved them. I have been making fleeces toys. I ordered wheels but do you think they will know what to do if they never had it ?. Thank you all for listening have a great day !! All the females have battle scars not sure if it was from breeding or actually fighting. Last edited by luigi; 11/09/18 02:50 AM. Gliders are RIDICULOUSLY smart and curious. They'll climb on it to check it out, discover it moves... then they'll be off & hopping to their little heart's content. Last edited by Hutch; 11/09/18 08:58 PM. The scars on the girls could be mating wounds and/or dominance wounds. Are the boys neutered? If they are neutered you may be able to intro them into the female cage. If you start seeing wounds again then they will have to live as bachelors. I put gritted paper perch covers on mine. I pitched that idea after a week due to potty/ poo mess. I then sewed a sleeve out of fleece. I made it longer than the perch and then twisted it tight and put zip ties to hold it in place. The wood will take on a smell, so I replaced it with 1/2" PVC pipe and put the cover on it. It has to be washed frequently (weekly), as they rub their cloatia on it and potty on it. It became a pain, so I eventually removed them and repurposed the PVC into toy parts. They don't have to have perches, they like the space. Maybe some corner hammocks and, bridges made from fleece would be better. It is easier to take out and wash.
Last edited by Ladymagyver; 11/10/18 08:05 AM. Yes definitely agree the perches are a mess and nasty. I am working making plans and building a pvc cage. I figure to give the feet a rest from cage bars. I did make fleece cage set for them but they are not very interested in the corner hammocks yet. I think it will take some time for them to use the things how they choose 路‍♂️. Thank you for the ideas !! Kim's question is very important. Do the boys have their bald spot on the top of their heads? Is it very pronounced if it is there? Do they have their poms? As Kim said, if you know for sure they have not been neutered, then it is best they live as bachelors until they are neutered. No the boys are not neutered they are both intact I want to keep them separate and all females together I currently have 3 cages of females and would like it to only be one cage for females and one cage for males. If you neuter the boys you can combine cages making one huge cage and have a colony. Do you know how old the two males are? Is there any reason you would not want to have the males neutered? Here on GliderCENTRAL we strongly discourage breeding gliders unless you know their lineage - where they come from for certain. The gliders you have are rescues, so you cannot be sure 100% Freda and Sweat Pea are not related. Do you have the lineage on your personal gliders you intend to breed to the male rescues? 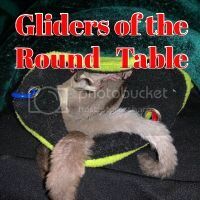 There is so much that goes into responsibly letting gliders breed. Why do you want to breed the gliders? Thank you !! I am not tech savvy at all.